The England international is delighted to have committed his future to the Red Devils, with his recent form under Ole Gunnar Solskjaer being rewarded. 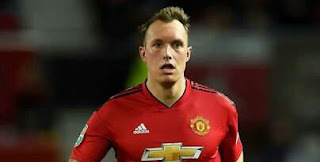 Phil Jones told United’s official website: “I am delighted to have signed a new contract. Manchester United has been a big part of my life for eight years and I love everything about this club. The deal agreed by the versatile 26-year-old includes the option for a further 12-month extension once the initial terms run down.He had been due to become a free agent this summer, but can now start planning for the long-term at Old Trafford.